A stunt usually recorded on video involving at least two people, a playground-sized roundabout and a small motor vehicle (moped, motorcycle, etc.). One individual presses the vehicle’s wheel against the outer edge of the roundabout’s platform and revs the engine. Individuals seated in the center attempt to withstand the increasing centripetal force as it spins faster and faster. When powered by a vehicle’s motor rather than human push, the roundabouts gain so much momentum that individuals can lose consciousness in a matter of seconds. 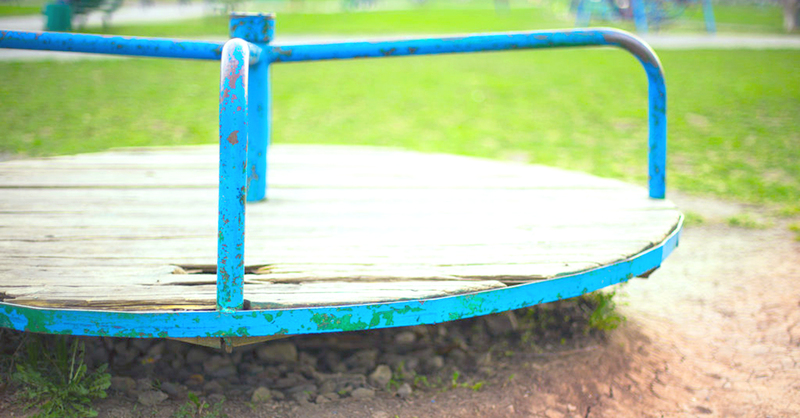 Unconscious participants often get injured when flung from the playground staple; some cases resulted in brain damage. Viral bulletin outlining the resurgence of a dangerous stunt known as the Roundabout of Death. The Roundabout of Death first appeared on YouTube in the early 2000s. The stunt resurfaced in the news on or around September 15 of this year when an 11-year-old boy sustained severe injuries after being pressured by other kids to replicate the act. With easily-accessible examples posted on YouTube, we would categorize any minor viewing videos of the stunt with the resources to recreate it as at-risk. Historically, similar stunts (e.g., the Tide Pod or Kiki challenges) swiftly gain traction on social media until their popularity declines autonomously, leaving many serious injuries behind. Although we haven’t seen any attempts made to recreate it in the U.S., we believe this trend has the potential to go viral as a result of its recent publicity.